Fast and honest way to get customer reviews. Feedback Rebate is a rebate customers can redeem by leaving an honest review. What if someone decides to cheat? As you probably already know, people don’t buy anything anymore without first looking at the reviews. 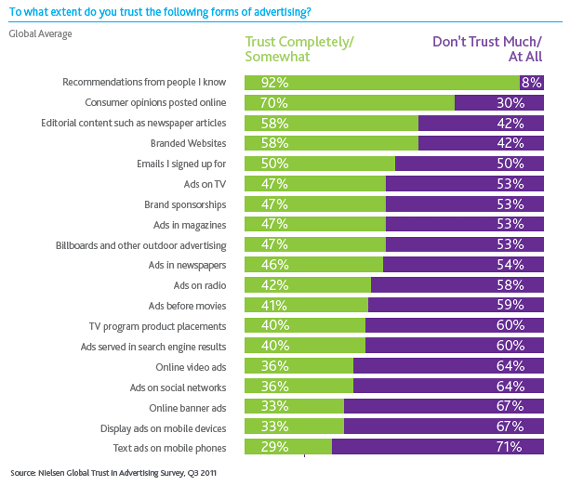 According to this Nielsen study, Customer Reviews are more powerful than ANY other type of marketing or advertising! What's the best way to get reviews? 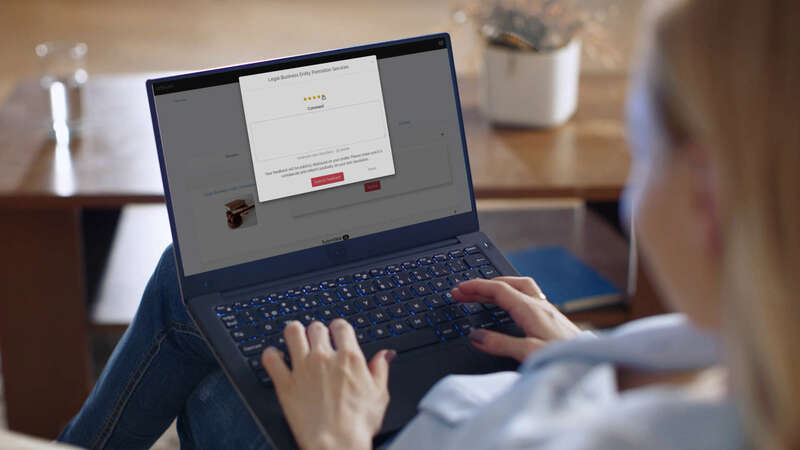 By offering a Feedback Rebate, you're essentially telling your customers that if they buy your product, they will be able to get some of their money back by leaving an honest review. This will not only help you sell more products and services, but it will also get you a review from almost every customer! To put this into perspective, you can get more reviews this week using Feedback Rebates than you probably got this entire year using some other method or platform. Your customer buys the shirt for the full price of $40. She gets an email with a special review link (almost like a receipt). She clicks the link, writes her review and gets $4 back. That's it. No need to beg or pray for customer reviews anymore. It happens automatically without any effort on your part. At the end of the day, the customer paid the same $36, as if the shirt was on sale, and the business got a valuable customer review essentially for free. In other words, with a discount you just get the sale; with a Feedback Rebate, you get the sale AND a review! First proposed by Lingfang (Ivy) Li Ph.D. in her groundbreaking paper Reputation, Trust, and Rebates: How Online Auction Markets Can Improve Their Feedback Mechanisms, Journal of Economics and Management Strategy (Summer 2010), Rebates-for-Feedback mechanism is now being used by Taobao (the largest online marketplace on Earth) and millions of its merchants. What are the results? Rebates-for-Feedback Increase Sales by 30%! Rebates-for-Feedback mechanism has proven to be very effective, but it can only be used at Taobao. Feedback Rebates were developed independently by Virthium as part of our reputation network. They can be used by anyone, for any type of business, on any number of external platforms. You don’t need Taobao, you have us! Every Feedback Rebate offer goes through our Virthium network. This provides an additional assurance and transparency to these transactions. In other words, no matter where you see a Feedback Rebate offer, you can be confident that you will be able to redeem your rebate on Virthium by leaving an honest review. Your customers receive a unique review link without which no one can leave a review. That’s right, there is no review-form on your page for just anyone to fill out. People have to actually buy your product and verify their phone number to leave a review. This means you won't see fake or anonymous reviews on your site or anywhere on our network. To put it differently, Feedback Rebate is just another form of a discount offered before the sale. You are not offering your customers any special favors for their reviews, you’re simply lowering your price to sell more of your product. Would you feel compelled to write a good review for a bad product just because you got it "On Sale"? No, of course not. If discounts are not biased, neither are Feedback Rebates because it's the same deal for the customer. "RFF (Rebate for Feedback) induces buyers to write more detailed feedback but does not bias the feedback toward positive feedback." Virthium is a 100% transparent network where each member is verified. This makes cheating nearly impossible. Anyone can see who is offering Feedback Rebates, who is getting them, and when. If someone decided to cheat by, for example, offering it only to their “happy” customers, it would be like advertising “$10 off”, then refusing to give the discount. Even if they tried to hide the fact that they are offering rebates, the reviews themselves are the proof of them doing so. Besides, who in the right mind would hide a discount from potential customers and then waste more money on something that could have been easily earned for free just by doing a good job? That would make no sense whatsoever. If your competitor decides to do that, congratulations! If thousands of people watched a movie and it got 9 stars out of 10, that's a great movie! Even though some people clearly didn't like it. There is a huge difference between getting a bad review when you only have a few reviews, and getting it when you have hundreds or even thousands of them. As we mentioned before, only your customers will be able to write reviews. They also have to join the network and verify their mobile phone number first. Each member has a public profile where all their reviews are listed. Because Virthium is first and foremost a Reputation Network, this is also their professional profile where their roles and contributions are listed as well (more on this later). Think of it as a LinkedIn profile or a resume. Leaving a negative, but well thought-out and respectful review is one thing, but if someone is rude or inconsiderate, it will hurt their own reputation. It's highly unlikely that anyone would do that to themselves, but there are also ways to remove a rude comment. Absolutely. We created an online store and added a fake product called the Feedback Rebate Demo. This way you can see an example of what the Reviews Widget looks like. You can add one of those to your own website if you'd like. This particular one was installed in just a few minutes. Feedback Rebates are provided by Virthium, which is a 100% ad-free, private and independent network, not a marketing platform. This means that there are absolutely no Ads of any kind. Unlike other social networks, we are not affiliated with any third-party advertisers. You and your customers are safe here. A restaurant might replace its "happy hour discount" with a Feedback Rebate, so every customer leaves a review after a meal. 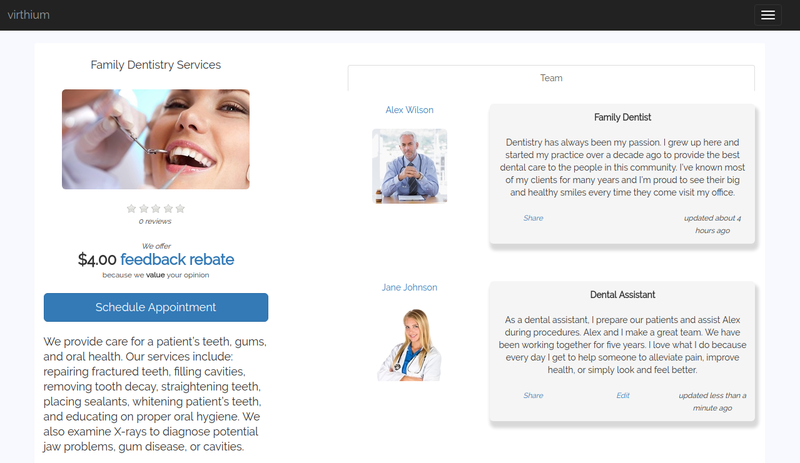 A dentist might offer Feedback Rebates to new clients to increase their confidence and signal high-quality. A company may create a listing for its internal IT team and send Feedback Rebates to its employees to increase engagement and foster internal recognition. A government official may offer Feeback Rebates to people in her district to inspire trust and communicate her full intention to deliver on her promises. These are just a few examples. Feedback Rebate is a universal tool for getting feedback. It can be used in a wide variety of situations. If you choose to offer Feedback Rebates, we will charge a transaction fee (25% of your feedback rebate) if the customer leaves a review. For example, if you list a $40 product with a $4 Feedback Rebate and your customer buys it, they would have to write a review within the next few days in order to get their $4 rebate. If they do, we will charge you a total of $5, send $4 to your customer and keep the $1 fee. If they don't, you don't pay anything and keep the extra $4 or get four more reviews essentially for free. This means that your reviews will likely cost you very little if anything at all. You either get a review or sell at the full price. You win either way! This mechanism allows us to empower every one of our members to get more reviews very quickly and build an online reputation that is based on the quality of their products and services, not the size of their marketing budgets. On Virthium, you decide how much to pay, when to offer the rebate, and when it expires. You will only be charged if and when your customer actually leaves a review. Fun fact: Discount vs. Feedback Rebate. That’s right, you just got 40 reviews for FREE just by offering Feedback Rebates instead of discounts! Even if every one of your customers writes a review and you end up paying a little more, wouldn't it still worth every penny? You just need to provide some information about your product or service and specify the Feedback Rebate you want to offer. That's it! 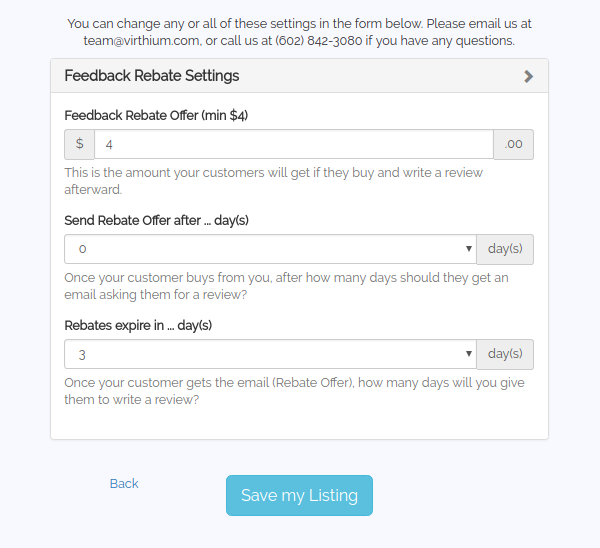 Once you set it up, you can manually send Feedback Rebates to your customers via email, or ask how to automate it completely, so every customer gets the Feedback Rebate with their receipt. By the way, your new Feedback Rebate by itself will probably spark more interest and engagement from your customers than the plain old "On Sale" sign. Don't you think? 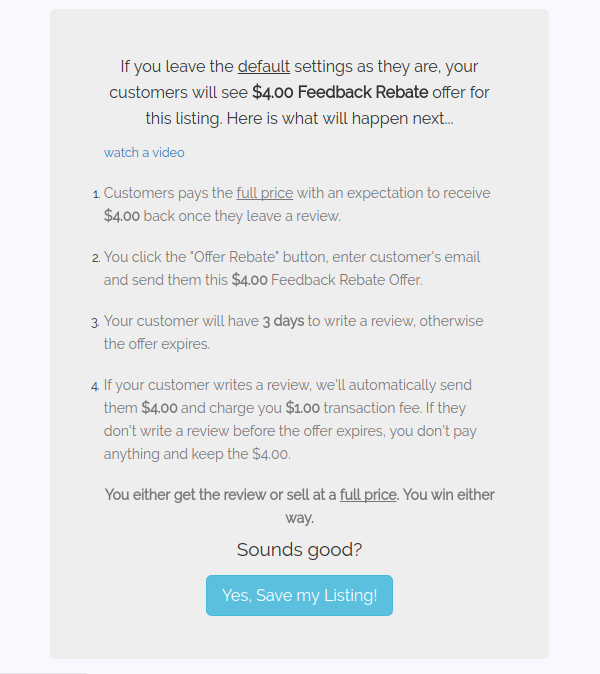 Feedback Rebates are a safe and honest way to get customer reviews fast! Other types of discounts can actually hurt the perception of a product (cheap, low quality). Feedback Rebates, on the other hand, instantly signal high quality and care, because they are offered with the intention to satisfy the customer, not just to make a sale. No one in their right mind would offer a Feedback Rebate for a truly bad product unless they want to get a ton of bad reviews. That’s why customers see a Feedback Rebate as a sign of high quality. The study we've mentioned above is literally called "Buying Reputation as a Signal of Quality: Evidence from an Online Marketplace." If you haven't already, check it out. The Cognitive Dissonance research suggests that when someone physically performs an action (writing a review), they are more likely to act in accordance with that action in the future. In this context, once your customer writes a positive review, they will actually like your product more and are more likely to buy from you again in the future. Feedback Rebates, by their own design, ensure that the best products and services get the best reputation, no matter the size of the marketing budget. In other words, you get reviews through the normal course of business with very little, or no additional cost. In fact, offering bigger rebates or offering them more often will just get you the same result. So your best strategy is just to make your customers happy and let them do your marketing for you. Feedback Rebates are an integral part of Virthium - The Reputation Network. If you chose to, and we sincerely hope you will, you can use Virthium's RoleTags to invite your employees (and yourself) to share your roles and contributions right on the listing page. Think of it as being the “cast member” of your product. This means that you and your employees are no longer just a faceless brand to your customers, but actual people they can relate to. In essence, every review is a story of how your work and the work of your employees affected someone's life. This connection is very powerful. It gives customers a whole new perspective and reason to buy, and you can only imagine how engaging and inspiring this can be to you and your employees. Read Our Story to learn more about RoleTags. You can display your reviews on your website or online store by embedding a widget or using one of Virthium's integration options (ask for more info). Check out our demo online store for an example. Your product or service will automatically be listed on Virthium.com for free as long as you’re offering Feedback Rebates. This means more potential customers will be able to search for and find your Virthium listing. 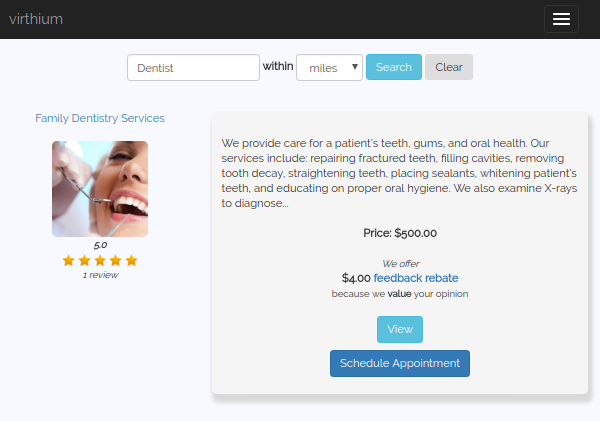 Think of it as a Groupon, but instead of discounts you’re offering Feedback Rebates. It's really quite simple. The more links to your page you have, the higher you rank in Google searches. Every review is, you guessed it, a link to your page! Obviously, there is no guarantee where you will rank or how you will appear in search results, but having a ton of reviews will definitely help. Your Virthium listings are “marked up” automatically so Google and other search engines can index them better and display “rich" snippets and cards that can include stars and reviews in search results. Feedback Rebate will not only help you improve sales and get a review from almost every customer, it will also signal high quality, increase customer loyalty, open up a new sales channel, and engage employees. The best part is that there is no risk in trying this out; there are no contracts, membership fees, limits, or penalties of any kind.